So, last Friday I took a half-day off work because it was Writer’s Lunch. 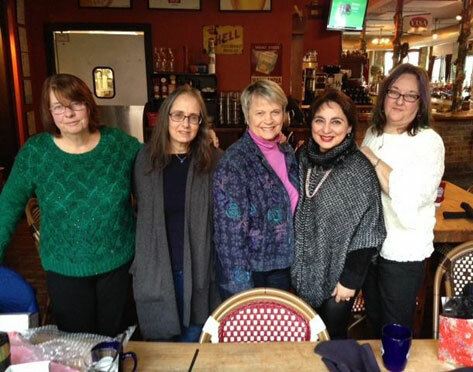 Every December for the past five – or maybe six – years, Annie, Elaine, Judy, Shauna and I pick a restaurant and go out for lunch. We have the best time. We laugh, we drink, sometimes I empty my purse because it’s filled with weird things that make people laugh (and inspired Shauna to write a poem) and, of course, we trade gifts. I was really excited about the presents I found my writer pals this year, and even more excited that I could include myself as a recipient. 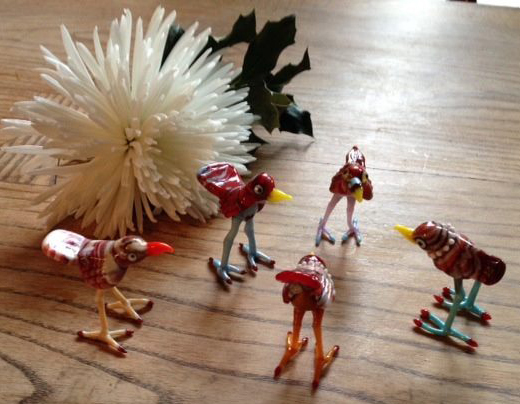 My friend Amy Waldman Smith in Toronto is an amazing artist, and recently she started making little glass birdies. I screeched and sent her an e-mail begging her to make some red ones so I could buy five for Writer’s Lunch. A flock of red birdies. That’s because Judy is a writing teacher and writer who owns and runs Redbird Studio. If this had been last year, I would have bought four birdies. Elaine (who has written 13 of the most fabulous vampire novels ever*), Annie (short stories and edits) and Shauna (novels, short stories, how-tos) have all done Redbird things years ago and for years. This past fall, my life was finally in a place where I could, too. I signed up for and took a four-week workshop. She is an incredible writing teacher and mentor. I’d always suspected it, but it was a great thing to discover as I move ever closer to producing a pile of paper with words on it. It also earned me rights to birdie ownership. Everyone unwrapped, and then we put them in the middle of the table. Judy got to choose first. Two were wearing pearls, and Shauna showed up with a gorgeous strand around her neck, so we all agreed that she had to have one of those. I took home the little birdie left after everyone else picked. Each is cuter than the next, so it was a win-win situation for all. Shauna was a judge for the 2014 Giller Prize, and she gave us all some of the books she most loved from the competition. I got a book of short stories by Dave Margoshes, “God Telling a Joke.” Shauna said lovely things about him, that he’s a really seasoned writer and a great one. She loved the book and was heartbroken that it didn’t even make the long list. Awards are funny, fickle things. I’ve gotten a few over the years, and they’re fun, but I think it’s a bad thing to take them too seriously. Shauna’s remark – that she loved the book and would have shortlisted it, but she wasn’t the only reader – is exactly why. The whole process is the very definition of subjective. In a different year with a different crop of judges, Margoshes might have walked off with the Giller. Then I read (thank you, Social Media) about Ayelet Waldman’s (no relation) tantrum because her novel wasn’t chosen as one of the New York Times Notable Books of the year. First I wanted to slap her. Then I felt sorry for her. Truly, the only thing I want for my word pile is for it to exist. Once that happens, I can make it what I want. If anything happens after, that’ll be fine. If not, that’ll be fine, too. Which is my way of saying that if I’m going to rip a page out of another writer’s book when it comes to handling non-attention, it’s going to be one of Dave Margoshes’.